Pinpoints your 2 most fertile days, so you can maximise your chances of getting pregnant naturally. Over 99% accurate at detecting the LH surge. Easy to read, the only brand with unique digital \u2018smiley face\u2019 results. Easy to use vs strips - in a UK study, 7/10 women found \u2018strips\u2019 were not \u2018easy to use\u2019 (111 women using and reading different test types). Clearblue - 2x more accurate than calendar methods. (Comparing a simple calendar method to likelihood of conducting a test on LH surge day (Ellis J., et al. Hum Repro (2011) 26: i76.)). 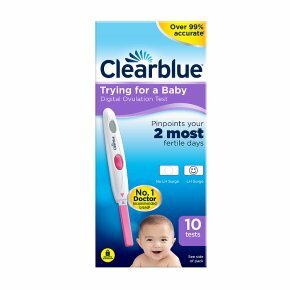 10 Clearblue Digital Ovulation Test sticks included.This easy to read Clearblue Digital Ovulation Test accurately pinpoints your 2 most fertile days each cycle, so you can maximise your chances of getting pregnant naturally. There are only a few days each cycle when a woman can conceive, the days leading up to and including the day of ovulation. But cycles are variable and so is the timing of ovulation, which means that 1 in 2 women could be trying to conceive at the wrong time of the cycle1. These simple urine tests are over 99% accurate at detecting the rise in a key fertility hormone (luteinising hormone) 24-36 hours before ovulation. A clear smiley face appears in the digital display when your LH surge has been detected, so you know this day and the following day are your best 2 days to try for a baby. For women whose cycles are variable, it can be especially challenging to accurately detect the timing of the 2 best days to get pregnant. A 20ct test kit will give you a higher chance of detecting your most fertile days. 1Johnson SR., et al. Hum. Repro. (2011) 26: i236. For more information on this product or answers to your questions, our Careline advisors are available for you 07:00 \u2013 15:00 hrs Mon-Fri, excluding Bank Holidays. Pinpoints your 2 most fertile days, so you can maximise your chances of getting pregnant naturally. Over 99% accurate at detecting the LH surge. Easy to read, the only brand with unique digital 'smiley face' results. Easy to use vs strips - in a UK study, 7/10 women found 'strips' were not 'easy to use' (111 women using and reading different test types). Clearblue - 2x more accurate than calendar methods. (Comparing a simple calendar method to likelihood of conducting a test on LH surge day (Ellis J., et al. Hum Repro (2011) 26: i76.)). 10 Clearblue Digital Ovulation Test sticks included.This easy to read Clearblue Digital Ovulation Test accurately pinpoints your 2 most fertile days each cycle, so you can maximise your chances of getting pregnant naturally. There are only a few days each cycle when a woman can conceive, the days leading up to and including the day of ovulation. But cycles are variable and so is the timing of ovulation, which means that 1 in 2 women could be trying to conceive at the wrong time of the cycle1. These simple urine tests are over 99% accurate at detecting the rise in a key fertility hormone (luteinising hormone) 24-36 hours before ovulation. A clear smiley face appears in the digital display when your LH surge has been detected, so you know this day and the following day are your best 2 days to try for a baby. For women whose cycles are variable, it can be especially challenging to accurately detect the timing of the 2 best days to get pregnant. A 20ct test kit will give you a higher chance of detecting your most fertile days. 1Johnson SR., et al. Hum. Repro. (2011) 26: i236. For more information on this product or answers to your questions, our Careline advisors are available for you 07:00 - 15:00 hrs Mon-Fri, excluding Bank Holidays. Read complete instructions before use. Before applying urine to the test stick it must be inserted into the test holder. Clearblue Digital Ovulation Test is not intended for contraceptive use and is not suitable if you have recently been pregnant, reached the menopause, have polycystic ovarian syndrome or are taking certain fertility drugs. Clearblue Digital Ovulation Test can be used if you are taking clomiphene citrate. Please read the enclosed leaflet carefully. This device is for home use. Keep out of the reach of children. Store at room temperature. Do not reuse the test sticks. Clearblue is a trade mark of SPD Swiss Precision Diagnostics GmbH ('SPD'). Copyright�2017 SPD. All rights reserved.